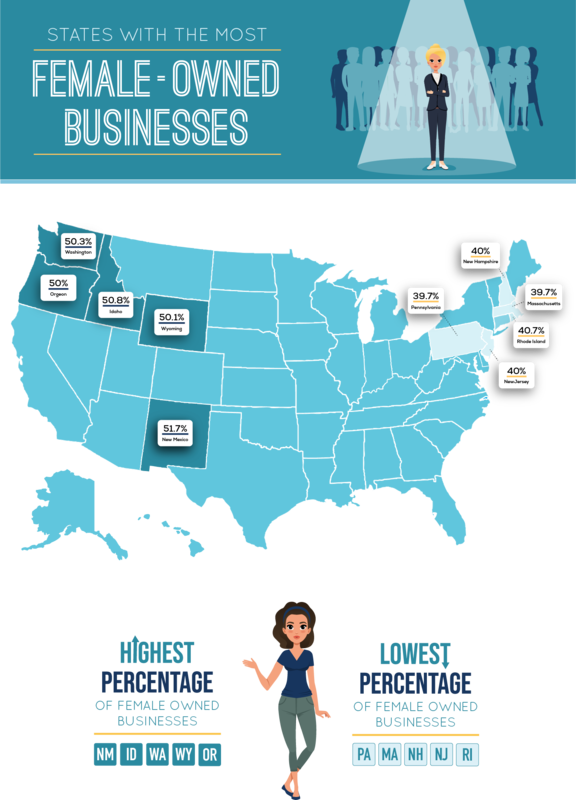 Female-Owned Businesses: How Does Your State Stack Up? If you look at headlines, the feminist movement has reportedly been gaining traction. But has that translated into the business world? Sort of. Women are more prevalent in leadership, but we’re still a bit off from parity. Though, it seems some women have worked around gender biases in business by starting and owning their own businesses. There were 9.9 million women-owned businesses in 2012, up from 7.8 million in 2007. We looked at the US Census Bureau’s 2012 Survey of Business Owners to find out how that 9.9 million spread across each state. But before we get into the results, let’s note two things. First, this 2012 report is the most recent data available from the Census Bureau. Books (#GIRLBOSS, Lean In, etc.) and cultural events (#MeToo, #TimesUp, women’s marches, etc.) have likely influenced women in business. We look forward to seeing how these societal shifts have affected female business owners in the next survey’s results. Second, we understand people identify outside of the gender binary used in the report, which may skew the results. Alright, let’s get into some of our findings. Female-owned businesses ranged from about 39 percent to just under 52 percent of the overall businesses in each individual state. This includes “nonemployer” companies, which don’t have paid employees. These tiny businesses made up the vast majority (89.5 percent) of women-owned companies, indicating many women entrepreneurs are solopreneurs. What shocked us most were the states that ranked the worst. The lowest performers were overwhelmingly Northeastern states. The eight states with the fewest women-owned businesses were New York, Maine, Connecticut, Rhode Island, New Jersey, New Hampshire, Massachusetts, and Pennsylvania last. In fact, Maryland is the only Northeastern state that isn’t in the bottom half—it ranks fourteenth. On the other side of the scale, of the ten states with the highest percentage of female-owned businesses, all but one (Florida) have populations with fewer females than the US median. New Mexico, Idaho, Washington, and Wyoming were the top four—50 percent or more of businesses in these states are owned by women. The feminist movement may have a long way to go, but this alone indicates good progress. Regardless of gender, business owners know the importance of making smart investments. Finding the right service provider for things like internet, phone, and TV is an important decision. With Frontier Business bundles, you can get all the services you need while saving yourself time and money. Methodology: Our data comes from the US Census Bureau’s 2012 Survey of Business Owners. We looked at both “female-owned” and “equally male-/female-owned” businesses by state. Percentages are taken from the total number of “firms classifiable by gender, ethnicity, race, and veteran status” in each state. Gender population statistics by state are from the 2010 Census.